The photos on this site are courtsey of "Generations by Bruhn Photography"
Free Veil with Any In-Stock Dress Purchased. Email me to let me know which veil you'd like so I can include it in your order! A few of the veils will coordinate with certain dresses and will be noted as such. Each one will be slightly different and we can make any veil match YOUR special dress! Also coming soon, are vintage-style slips to wear under your First Communion Dress should you so desire. If we feel a slip is necessary, it will be included in the cost of your dress. Otherwise, it's entirely up to you as to whether or not you'll need one. A simple wreath of delicate flowers gives way to a veil trimmed with ribbon. Wonderfully simple, Wonderfully beautiful! This wreath veil can be trimmed to match any dress you choose! Similar to the Blossom Wreath Veil, only the flowers are different. This veil can also be done with a narrow ribbon, lace or eyelet to match whatever dress you choose! As always, our signature butterfly completes the look! Designed for the purists or to compliment a dress already rich in detail! The only addition to this design is our signature butterfly, perched along the edge! The pearl detail on this little headband makes quite a statement! The ribbon edging the veil is trimmed in lace and adds to the overall luxury of this design. It would match perfectly, a design soon to be completed named "Constance". Stay tuned! Tiny delicate blossoms adorn a simple headband to create this darling veil. We trimmed it using a wide ribbon and added our butterfly to the edge. 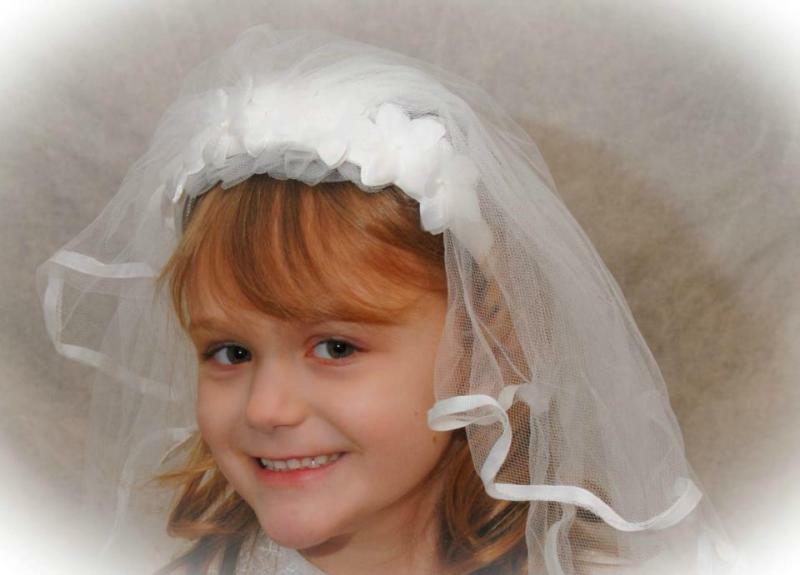 This veil was designed to compliment any of the First Communion dresses with eyelet trims. This design will soon be available with a wreath headpiece. Utterly charming is this headband covered in little rosettes. Perfect with almost any of our designs! We kept the edging simple...adding only a butterfly to complete the look! A cluster of flowers is offset with a wide, scalloped lace trim, making this veil something very special indeed! Copyright 2012 Jenny's Angels. All rights reserved.